I recently moved house and switched to Sky Fibre (FTTC) broadband. Overall it seems like a pretty good service – customer service seems excellent and they don’t do traffic management. So great right? In order to use their service, Sky force you to use their noddy ‘Sky Hub’ by using MER authentication. They actually install a hidden username and password specific to you onto the router they send you – only that router will be able to connect! They will also not give you this password if you ask for it. This means that even if you have your own VDSL modem, it won’t be able to connect. Rubbish. Use WireShark to sniff the DHCP requests emanating from the Sky Hub to find the credentials. Configure DD-WRT to send the credentials you sniffed earlier when requesting a WAN IP address. This guide assumes you have an S101 or S102 Sky hub. You have successfully connected your noddy Sky Hub to the internet and it is working happily. You will need a separate dedicated VDSL modem. N.B. You need a modem, not a router. See below for list of appropriate modems. A router with DD-WRT flashed on it already. I am using an Asus RT-N66U which is super awesome btw. N.B. On OSX WireShark takes ages to start the first time (like up to 5 minutes!) – give it a while. Why DO I need a VDSL Modem? The vast majority of DD-WRT compatible routers have an ethernet WAN port. They require a separate cable / ADSL / VDSL modem. Example listing – This one is even unlocked (though unlocking is not required). Connect your Sky Hub to the power and to your computer using an ethernet cable. Have nothing else connected to the Sky Hub. Especially not the telephone cable or separate modem. Make sure you connect with and ethernet cable, not WiFi. From now on we will refer to this as your ‘client identifier’ since that is the technical term for it. N.B. You should notice that the first part of your client identifier is your MAC address. The part after the ‘|’ is your password. N.B. The diagram above shows a face-plate with a built-in microfilter. If you don’t have one of these then you will need to also use a separate microfilter. Verify that the power and DSL lights on your modem are solid, indicating a good DSL connection. The Lan1 light on your modem should also be lit, but may be flickering occasionally. SSH onto your DD-WRT router. If you don’t know how to do this then read this and do some Googling. You can enable SSH access on you router using the web GUI. Windows users are encouraged to use Putty for SSH, OSX and Linux users can just use the Terminal app. We need to figure out which version of udhcpc is installed on your router. In recent versions of DD-WRT, the udhcpc binary was updated and the command needed changed. This step will help you figure out if you have the old or new version and therefore which command to use. Now we’ll construct the command to get DD-WRT to connect to the internet. udhcpc --background -i vlan2 -p /var/run/udhcpc.pid -s /tmp/udhcpc -c "mac_address@skydsl|password_from_wireshark"
Note that you need to replace the -c section with your client identifier you found earlier. You need the quotes. If you found that it was the new version, then the command you need is a little different. Use this website to convert your client identifier to hexadecimal. Convert the whole client id string from the start of your mac address to the end of the password (including the ‘|’ symbol). Note that you need to replace YOUR_HEX_STRING_HERE with the hexadecimal version of your client id. If things aren’t working properly, you will just see the ‘Sending discover…’ line repeated as udhcpc re-tries. Let it make a couple of attempts, but in my experience when it is working, it works very quickly. If it isn’t working then double check everything is wired correctly and that the DSL light on your modem is on. Failing that, try reverting back to the Sky Hub and check that still works. If it does, try all the steps again. Once you have obtained a lease your internet connection should be working! Hooray! Time to set this up permanently so your router connects automatically after each reboot. In the web GUI of your router under ‘Administration > Commands’ enter ‘killall udhcpc’ followed by the command you constructed in step 5. The killall and command from step 5 need to be on separate lines. Restart your router – your internet connection should now work. Put the Sky Hub back in the box in a cupboard where it belongs. It sounds like you are trying to connect your tp-link router directly to the VDSL socket. That will not work – that router supports ADSL not VDSL which is what Sky Fiber uses. You can use that router, but like me, you will need a separate VDSL router like one of the two models I highlighted in my guide above. Thank you so much for replying. Do they make any routers with the VDSL combi. if not what speed do the ports on the bt unit carry. Thanks in advance. There are a couple about, however not very many. The BT modems can handle up to 100Mb but your internet connection will be less than that so it shouldn’t be a problem. To be clear, the modem is only handling the connection between your router and the internet and so won’t limit the speed of your home network. I will try and have a quick look when I get to a computer, but I urge caution. Few routers support vdsl. Of those, fewer still support the dhcp client id field needed to connect to sky fiber and not many are supported by DD-WRT. Wife approval factor is an issue, I just have the modem near the phone socket and run a long Ethernet cable to my router which is out of sight in another location. Spoke to a guy i know from Bt might be able to get me one . Would i be able to operate with only that piece of equipment . From my googling, I can’t see any material stating that your TP-Link AC1200 router supports the DHCP ‘Client ID’ (aka ‘Option 61’) with the stock firmware. If that is true, it means that it can’t connect to the Sky Fibre network. This would not be a problem if you could flash DD-WRT, but it does not seem to be supported either officially or unofficially by DD-WRT from what I can tell. So basically if I am right about the above (notice the IF), you are in a bit of a pickle. If you have managed to flash DD-WRT or are confident that the stock firmware allows you to specify a client ID, then the only other thing you need is the VDSL modem. I’ve actually got one of the modems from my guide kicking about that you can have for free if you want it – If you drop me a private email with your address I can post it to you – I’m only gonna throw it away anyway since it’s cluttering the place up. My email is: b l o g at charleswilkinson.co.uk (remove the spaces and replace the at symbol. Um… well no, as I stated – the modem I can give you will only be useful if your router supports dhcp client auth. I’m not sure what you mean by ‘BT fibre hh hub’ but if you mean a BT Home Hub for use with BY infinity, then no. That will not work. 1 – A VDSL modem (which I can give you). 2 – A router which supports DHCP client auth. 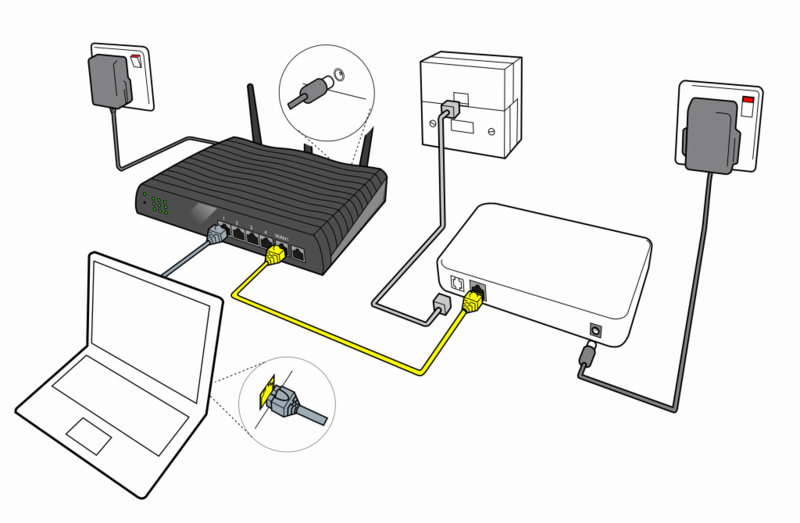 Any router with DD-WRT flashed on it should be fine (you just have to follow my guide above). To be honest though, with the greatest respect in the world, your questions and answers don’t make you seem like the kind of ‘power user’ who actually needs to replace the Sky Hub. Why do you want to replace your Sky Hub? What features do you feel it is missing? I’m a bit worried you are going to a lot of effort and money for no real reason and want to make sure it is the right thing for you. With all due respect. Everyone who has made this change have had valid reasons why they do so they can get the level of service they require. This is not something I have just got up and said I feel like I messing around with my Internet. I’ve been thinking about this for over a year. Is someone who needs a high speed stable service 24 hours of the day for work, gaming etc. With a minimum of 6-8 devices running, not a power user then I guess I’m not. I do know what I want to do. Maybe you don’t understand, thanks for your help so far anyway. Woah, dude – Sorry, I didn’t mean any offence! I was just genuinely worried that I was leading you down a path you weren’t ready for. Ok, so let’s get this working for you. Does the router you are planning to use allow you to supply the dhcp client Id with the stock firmware? Which router do you want to use? Are you going to flash DD-WRT on it? Thanks for the guide – very useful! I’m wanting to use dd-wrt features for QoS and connection management. Reading the guide and subsequent discussion, it seems VDSL modem is required. Its not possible to use the Sky HH (SR102) to connect, turn off wifi on HH, plug in new dd-wrt router to the HH and have everything connect through the dd-wrt router? Probably a silly question and have not seen this particularly suggested, so I guess not. Yes it is possible to do that, however the HH is also a router with a firewall and DHCP server among other things. If you hook it up in that way then QoS should work, but you will have problems with assigning ports for inbound connections such as SSH or torrenting as you would have to configure the firewall on the HH as well as on the DD-WRT router. This is called ‘double NATting’ (Network Address Translation) and is less than ideal. Hi Charles – great site and support. Ive the Nighthawk and recently moved to fibre on the SR201 hub. I’ve got the password and the setup with the ECI BFocus v2 but I’m not getting a WAN IP – I’m only using the BFocus out of the box – is there something else I need to do with it as this isn’t mentioned in any guides? I notice you mention the other modem is more ‘hackable’ ? No, you should be able to use it out of the box. Try plugging your sky hub into the modem instead and see if the smiley face goes green. That should confirm that the modem works. Thanks for taking the time to write this Charles – concise as can be for a guide like this and up to date. Done this before on my ADSL connection with my netgear 6300 and quite a few steps had changed. I actually still have a spare modem kicking about if you want it – they guy I offered it too took issue with my advice for some reason (see comments above) and stopped talking to me so he never got it. I’m having a problem trying to configure udhcpc. When I run ‘udhcpc –help’ I don’t get any output and when I run the command without the background switch it just hangs on a new blank line. If I ‘CTRL + C’ I return to a new command line. I’m guessing it’s a completely different version of ‘udhcpc’ to the two you mentioned. I’m using a ASUS RT-N16 with a 18xxx build of DD-WRT. I re-flashed the router with a slightly newer kong build and still had the same results. No luck getting any usage instructions either. Here’s a clip of my terminal when I try. You should get the version of busybox printed out. Then you can look up the busybox man page for that version online. It will include the usage instructions for the udhcpc command. P.S. If you have just updated to a newish firmware, I would bet good money you have the new version of udhcpc, not the old one. I couldn’t workout how to upgrade udhcpc or busybox… It looked like it was way over my Linux skill level… 🙂 Anyway, after trying a number of different builds I found an article on the DD-WRT forum stating there was a 3.x kernel based build (24461) that would run on the Asus RT-N16(Model I’m using). After flashing it I tried getting some usage instructions out of ‘udhcpc’ and it worked :). Oddly the Busybox version was the same as some of the other 2.6 kernel builds I had used. I did read somewhere that some of the commands are striped down to save space. Thank you so much Charles for posting this article and for your help. I’m afraid I don’t know what those errors mean and quick googling doesn’t give much either. Let me know if you ever get to the bottom of it! Hi Lisa, I wondered the same also. My thinking is that to actually perform that test would cost Sky money and they have absolutely nothing to gain from it, so they won’t bother. Sky don’t really care what router you use, the only reason they lock it down is so they don’t have to train/pay for support staff to diagnose problems with any possible router – which makes sense really. In any case, even if they did terminate your connection, you wouldn’t have to pay them any more so you could switch to a different provider like Virgin. I wouldn’t worry, I’ve had mine in place since October 2014 with no issues and I’ve chatted with Sky employees on their forum about it – all they say is ‘We can’t offer support for other routers’. First hope you can help. Read your blog and I think I need a separate modem. I’ve brought a TP-AC1750 router, and have sky fibre, so currently my pants sky hub SR102 direct into filter box into wall. Firstly I can’t seem to find my router on WwWrt list? Is it supported do you know? I’ve had a look into it and I’m afraid that as far as I can tell, your router is not supported by DD-WRT and does not support the MER authentication that sky uses out of the box. That being said, you may still have a chance. Your router does seem to be supported by Open-WRT (see here) and Open-WRT does apparently support the feature required (in much the same way as DD-WRT does in my guide). See here and here. Unfortunately I can’t help you much with Open-WRT as I have never used it, but theoretically it should be a very similar process. What I can tell you is that, as per my guide, you will need a standalone modem as well. I have a spare one if you want it. That being said, there is a simpler approach that you could take. You can leave the Sky hub plugged in, but turn off the WiFi (optional) and simply connect the WAN port of your shiny router into one of the ethernet ports of the Sky hub. This way you will be using the Sky hub as your modem and it does all the MER auth crap. The only disadvantage is that you are in a situation where you are using ‘Double NAT’. This means that your Sky Hub has a firewall and port forwarding and so does your TP-Link router. This is only really a problem if you need to open inbound ports as it means you have to do it in two places (not very convenient). It also probably means that UPnP won’t work and so you may have trouble accessing online services used by consoles like the PS4 and Xbox. Hi Charles. Looking to get rid of my SR102. Was initially looking at the Asus RT-N66U – 900Mbps but I’m just wondering if it’s worth forking out the extra thirty quid for the Asus RT-AC66U AC1750 http://goo.gl/5HkU0G ? What do you think? Personally I always prefer to pay for the best and have it have a longer useful life. That being said, I can’t see enough of a difference that it will cause you any trouble saving the 30 quid. I have been for a while now running sky fibre, using the sky router and then my Netgear R7000. I figured I’d try this guide today, and after flashing a version of DD-WRT onto the Netgear, followed this guide to the letter. However I never get a lease, just endless “Sending Discover…”. What am I doing wrong? Sorry for the delay. I had the same trouble and it was because I was using the wrong command for my version of udhcp. Try and find out what version you have and check the man page for it. It is possible that you need something different from the two alternatives in my guide. Did you fix this? I’m having exactly the same issue. The link to the video doesn’t work any more. Is there an updated one or alternative please? Thanks for the notification! I will endeavour to update it as soon as I find/record a decent alternative. Updated – there was some issue with the Youtube Embed tag. I recently purchased archer c5 from tp link. I have it connected to Sky Hub on normal connection, but I am having fibre activated on the 9th April. All these steps seem scary to me, I don’t want to break the terms of Sky so just want to go through the Archer. There seems to be a Dd wrt firmware which supports this router but is there a simpler way to do this? I work full time and don’t have the time to fiddle about it took enough of my bank holiday last night on the phone to tp link with a Chinese call centre to get my unlimited to work, finally managed to get it up and running. Please help. Is there any YouTube videos to better explain this? Or another way around it.the router seems to have Mac settings but whatever that means blah. I totally understand – it’s a little involved. Unfortunately I wrote the guide as simply as I could. However, we should investigate if you really need to get the Archer actually handling the internet connection itself. The key question is, what do you need the Archer to do that the Sky Hub is not able to do, or do well enough? Basically you may be able to use the Sky Hub as the modem and the Archer as your router, but it depends on why you want to use the Archer at all e.g. better WiFi range, better QoS settings, VPN etc..
Basically then I don’t think you really need to do the steps above in order to get what you need. You can simply connect the Sky hub according to the instructions, connect your Archer’s WAN port to a lan port on the Sky hub and then put the Archer into the DMZ of the Sky Hub. This will mean you are effectively using the Sky Hub as a modem only – You can turn the wifi on the Sky hub off. I’m afraid I don’t have explicit instructions on how to do this, but Google should be your friend. Hey buddy. All seems to be working had it connected like that. Hopefully it’s legal and I don’t get caught. At the end of the day I think if more Sky customers that have a bit of technical knowledge were aware that it was this straight forward to change to a higher end router more people would buy them. I’m now going to be buying a few more 802.11ac adapters to go with the router..
Glad the guide was helpful! By all means consider this guide free (as in free beer) so use it how you like. Your choice, however I would appreciate it if you would name me as the author, or even better simply link your customers to my blog page. I have the domain and hosting paid up for the next decade so it should stick around! That’s great, thanks 🙂 I’ll drop the link on here when I’ve written the post. Hi Charles, not sure if I am the only one struggling here with SR102, but I never see discover packets. I have tried all LAN pots, tried disconnecting WAN port from the router also. I only see Request and ACK packets. Any suggestions? Well done! Although I am surprised that Sky shield had an impact as I thought it was a web configuration rather than anything actually installed on the router… How did you disable it? I haven’t done any packet sniffing just yet but have found that the sky router will give up various passwords if you simply use the “backup config” option on the maintainence page. The username given in my .conf file is 6 characters added to the front of the wireless MAC address. If that sounds familiar it may be an easier way to discover the username and password? Hi Charles, great guide, thank you! I would like to clarify something, if I may. I am currently running a SR102, with a second router (ZyXel USG40 Firewall/Router) attached via the DMZ. However, for the USG device to work “properly” it needs to receive the correct WAN-IP that is supplied by the ISP (Sky). Currently, it just sees the DMZ IP at the WAN-IP (192.168.1.254). If i were to use my spare DD-WRT router and connect this to a HG612 modem (I have one unlocked) and follow your guide, would it then be possible somehow to forward the WAN-IP to the WAN port of the USG device, rather than using it as just 2 linked routers and the USG device only getting the DMZ IP? Hope what I’m asking is making sense. Basically, if I could turn the SR102 into “modem only” or “bridged” mode, I suspect it would just be a case of connecting the 2 together, but alas, the SR102 doesn’t allow that. Would using a DD-WRT router allow it to pass the WAN-IP? Sorry for the very slow response – I have not been paying enough attention to my blog recently. The lack of “modem only” mode is exactly what this guide deals with, so yes – this guide will solve you problem. However, if you can hold on a little longer, I am in the middle of putting a guide together on how to add a modem only (bridged) mode to your SR102. It does require cracking it open and flashing via a serial connection which makes it more scary for n00bs, but it is actually easier in some ways. I was wondering if you post the guide how to add a modem only (bridged) mode to y SR102? Releasing IPs frequently is quite an unusual requirement – do you mind if I ask why you want to do that? – There may be an alternative approach. Secondly, can I just ask, is dialling into the router via SSH necessary, does the DD-WRT router simply not ask for your Sky username and password? Genuine question, as I’m about embark on this journey for the 1st time. Yes it is necessary. The DD-WRT GUI does not support the weird authentication protocol that Sky uses. As such, we have to ssh onto the router and configure it on the command line. Best advice I can give you is never assume anything with DD-WRT. Don’t think of it as a beginner friendly, pretty much gonna work easily sort of task installing it. Also, don’t download the firmware from the router database – it is very often out of date. Check the wiki page for the router and also read up on the forum thread dedicated to that router – that is where you will find the best version of DD-WRT to use. I tried dd wrt couldn’t get it to work with sky fibre, so i my set up is modem zyxel q1000z (us quest/century) in transparent bridge mode with asus DSL-AC68U (not to clever as one box solution) as a router handling the mer option. it works great gigabit Ethernet too. I am having a massive problem with setting my r7000 up with sky fibre. I have done all the steps but it just gets stuck on sending discoveries. I have tried starting from step 1 but I still get the same thing. I have tried MANY guides on Google but this one seems to get me the furthest but still not all the way. I had the same problem – that was before I realised that I had a different version of udhcpc (hence the two different options in my guide). Double, then triple check the version of udhcpc you have and that you have entered the command correctly. If you are still struggling, paste the output of udhcpc –help as well as the connection string you are trying to use and the output of busybox so that I can help you debug. hello great post but I’m having problems on wireshark highlighting option61 as I’m using a macbook pro. any tips on how i can extract my username and password into text form? What trouble are you having with wireshark? On my Mac it took so long to start I thought it had hanged. Give it 10 minutes if that is the problem you are hitting. Instead of using wireshark, I found this info. It worked much, much faster than using wireshark or tcpdump. Thanks for the guide. It worked beautifully with my old TP-Link, but I recently switched to a Linksys WRT1200AC and I cannot get udhcpc to work at all. The command “udhcpc –help” does not work. I am using latest DD-WRT firmware for linksys [Firmware: DD-WRT v3.0-r29059 (02/09/16)]. Please can you help? I am at my wits end…..
Hmmm. That’s a pain. I’m on my phone at the moment so please excuse any brevity. When I was having a similar challenge I discovered that udhcpc was installed as part of busybox and so I had to work out which version of busybox my dd-wrt version was running, then find the udhcpc section of the busybox manual for that version. I think there’s a command to show you which version of busybox you are running. Have you confirmed if vlan2 exists? Do a ifconfig to see what is there. Hi, Thanks for the guide – managed to replace my SR102 on Sky Fibre with a C9 fairly painlessly! Can’t understand what’s wrong. I know the username / password / HEX conversion is correct. The line is working with the Sky SR102 router. I just don’t understand why it’s not working for me. I realised that I had a different version of udhcpc (hence the two different options in my guide). Double, then triple check the version of udhcpc you have and that you have entered the command correctly. You need to try and prove that you have the correct udhcp command syntax – DD-WRT/busybox may have updated udhcpc and changed the command syntax. BusyBox v1.22.1 (2014-04-16 22:55:13 CEST) multi-call binary. I reset the HG612 to factory settings. After I did, I noticed that, in Basic>WAN, DHCP transparent transmission was enabled (before reset it was not enabled). After that, ran the script, connected! DD-WRT all setup now and seems to be working fine. Sorry I didn’t reply – I wiped my phone and forgot to install WordPress app so missed the notifications about your comments. Glad you got it sorted. I am using the HG612 setup with R7000. However at 12pm midnight exactly (every night) the connection is dropped. Anybody else experienced this? Did you ever resolve the issue with the start up string you are using on your R7800? One thing I dont quite understand though, is why does Sky Authentication accept the openreach modems Mac address? It doesn’t. Even if Sky can see the openreach Mac address, which I doubt, they are just looking for the authentication request, which we set to include the SkyHub’s Mac address instead. Hi could you please throw some light on this question as it has been raised but not answered. could you please explain if the last three lines are issues that need to be addressed or is this normal. I am using an Asus ac88u with wrt v3.0-r28647. I have entered the information into the command of the router and I do have internet connection but the internet light on the router shows red. I’m afraid I’m not sure what those errors mean. However it does look like the router has successfully established a connection, which is good. It may be that your router doesn’t use vlan2. I would suggest trying to figure out what vlans are active. Would this work with a standard sky adsl connection? I’m actually not sure, but worth a shot! Worst case is that it doesn’t work, but it won’t break anything. The issue is that the master socket in my home only has one socket instead of two. I think I would need to split the line for another socket. I’m using a microfilter currently for the broadband and the telephone line. I’ve managed to get my Netgear R7800 up and running with DD-WRT and it seemed to be working fine. However I have a few gremlins you might be able to help my with. 1. I recently noticed the internet would go down every hour. It seems to coincide with the DCHP lease renewal, and I realised I managed to accidentally switch on IPV6. I was getting NTP server issues in the log. I have disabled IPV6 so hopefully that’ll fix the issue, but do you have any experience with IPV6? 2. Using you udhchp script doesn’t work exactly – I have to add ‘&’ at the end of the command otherwise it doesn’t seem to do anything. However when I do add the ‘&’, it seems to connect OK but the WebGUI crashes, so I have to restart the router. My concern i that I cannot add the command to the start-up script, otherwise my WebGUI will keep crashing? Just to follow up, I have reset the router to factory defaults and the 1 hour lease problem has gone. However it now disconnects every 24 hours instead! Don’t have Fibre (just regular ADSL Sky Broadband), but would like to be able to use my DD-WRT router. Can you tell me if the same procedure applies? Will I need a different kind of modem? Sky did send me an SR102 but I’m not using it – still using an old DG834G – but neither have the Ethernet out to connect to the DD-WRT router.